As stated by the UN Secretary-General Ban Ki-moon, she is “a brave and gentle advocate of peace who through the simple act of going to school became a global teacher.” At the age of 15, she was shot in the head; however, being born with a strong will power she survived the attack. In today’s world, most of our children make excuses to skip school for at least a day. However, in an educationally unrest country like Pakistan there is a girl, Malala Yousafzai, who wants education for every child born on the planet. She is a young and fearless 18-year-old soul who advocates for girl education even after Taliban issued a death threat against her. Being the youngest person to receive a Nobel Prize in 2014 at the age of 17, she is trying her best for all the girls from all the parts of the world to be allowed to receive education. In the year 2013, European Parliament awarded Malala Yousafzai the Sakharov Prize for Freedom of Thought. United Nations declared her 18th birthday to be celebrated as Malala Day on November 10. She is an international symbol of hope and courage. 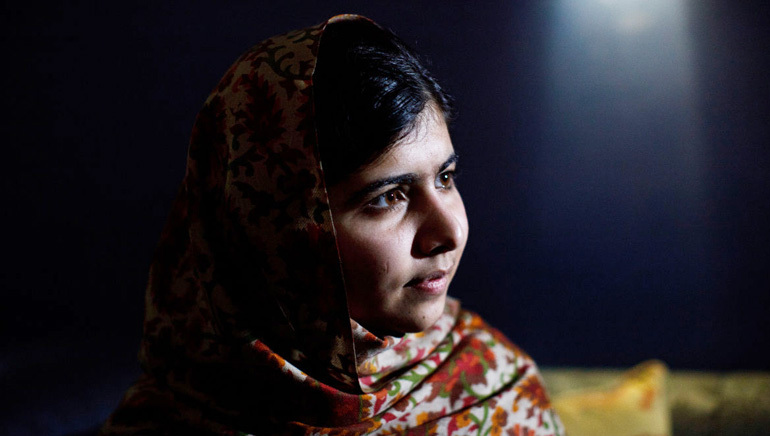 In her autobiography, ‘I Am Malala’ she wrote:Today we all know education is our basic right. Not just in the West; Islam too has given us this right. Islam says every girl and everybody should go to school. In the Quran it is written, God wants us to have knowledge.